Josh Moreman scores the winning goal for Spalding against Coalville. Photo: Tim Wilson. Peterborough Sports made it 85 goals in 16 United Counties Division One matches with an 8-1 drubbing of hosts St Neots Saints last night (November 24). Sports have won every one of those 16 matches and already boast a 15-point lead at the top of the table. Action from Spalding v Coalville. Photo; Tim Wilson. Sharpshooters Avelino Vieira and Kark Gibbs both claimed hat-tricks with wide men David Cobb and Jordan Macleaon also on target. St Neots had actually taken the lead midway through the first half. Elsewhere the misery goes on for Stamford AFC who were beaten 3-1 at home by Grantham in the Evo Stik Northern Premier Division. That’s no wins in 10 home league matches for ‘The Daniels’ - they’ve only drawm three of them - and they are now 10 points from safety. 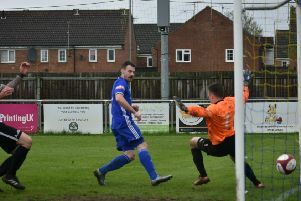 Paul Malone gave Stamford the lead against a Grantham sitting just outside tyhe drop zone following a goalmouth scramble, but the visitors were largely dominant throughout. In contrast fourth-placed Spalding United are enjoying a great run of form in Division One South. Josh Moreman scored the only goal of their game at home to second-placed Coalville on the stroke of half-time. Market Deeping’s Lincs Senior Trophy quarter-final against Boston Town was postponed because of a waterlogged pitch.